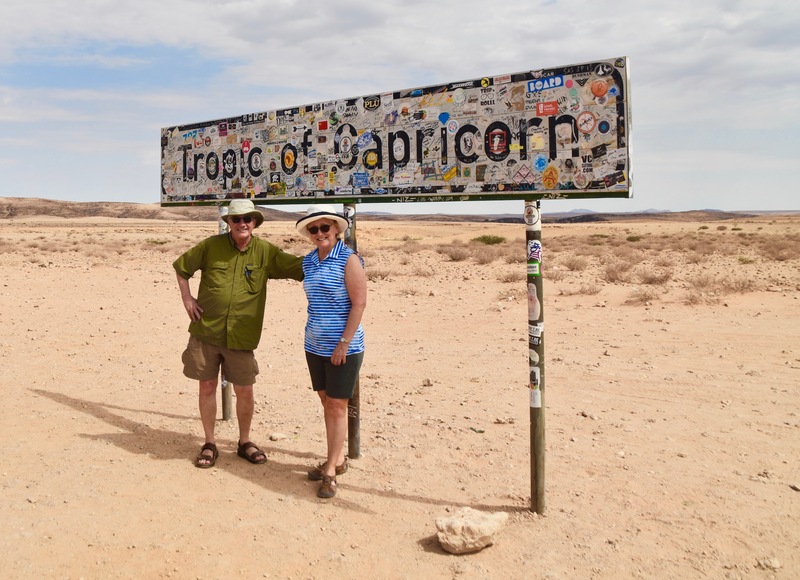 Alison and I just completed a ten-day tour exploring Namibia with Canadian travel company Adventures Abroad with whom we have traveled many times. Originally Namibia was not high on our travel priority list. Our first trip in 2019 was supposed to be to Southeast Asia, but Alison’s work commitments changed and we had to alter our plans. Checking out the Adventures Abroad website I noticed that a trip to Namibia & Botswana fit our new travel dates. By coincidence I was on another AA tour in Mexico with veteran guide Victor Romagnoli when I came across the Namibia tour. Asking him about it, he assured us that we would not be disappointed and that Namibia was a very underrated destination. Having completed the tour I can say that Victor’s assessment was, if anything, an understatement. Exploring Namibia with Adventures Abroad was simply one of the most varied and interesting tours we have ever undertaken. The rest of this post will explain why. First though, I want to write a bit about why it makes way more sense to travel to Namibia on an organized tour than to try to do it on your own. That may seem like a ‘Duh!’ question, but a number of guidebooks like Lonely Planet actively promote the idea that traveling through Namibia on your own in a rental vehicle is not too difficult. I totally disagree. Although Namibia has a very good road system linking Windhoek with the other major small cities of the country, many of the top tourist attractions like the Namib Desert, the UNESCO World Heritage site of Twyfelfontein and the Skeleton Coast involve extensive travel on dirt roads that just beg to flatten a tire or worse. The distances between service stations are vast and the heat searing; a breakdown could be disastrous. Also, while there is no real fear of personal violence in Namibia (except maybe from lions or hyenas), petty crime, especially breaking into cars is common. One of our guides told me that some Namibians view an unprotected vehicle as a shopping mall. While in towns you can pay guys to watch your car while you are away from it, (essentially human parking meters), there is no such service in the country. Most importantly for me, the lack of a guide who can speak the language of the locals, spot and identify wildlife that you would never notice on your own and generally make sure every goes smoothly is the main reason not to travel on your own. In fairness, if the only thing you wanted to do in Namibia was to travel to Etosha National Park, stay in a lodge and view wildlife at the various water holes in the park, you could do that on your own. But you still would be at a huge disadvantage without a guide to find the best places, identify the species and take care of the driving while you just enjoyed the experience of being in one of the best wildlife parks on earth. Wait a minute – I thought this was an Adventures Abroad tour? Occasionally, on tours that, by necessity, involve very small numbers, like safaris, Adventures Abroad uses agents based in the country you are visiting. This was our experience on our AA trip to Kenya and it was excellent. 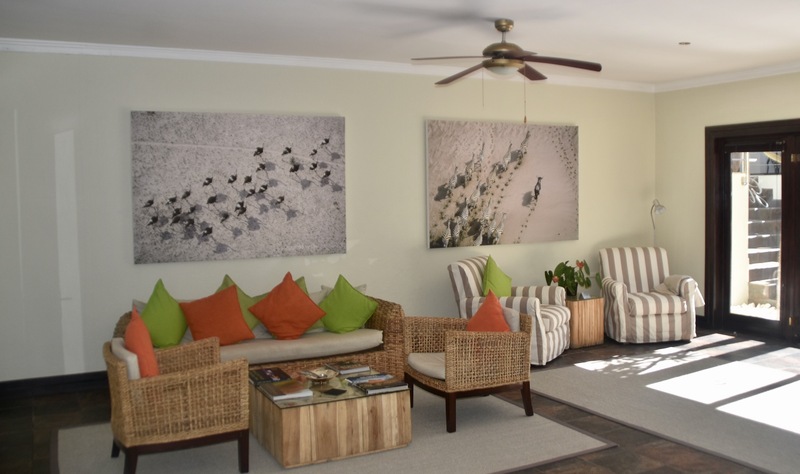 In Namibia the on the ground agency is Ultimate Safaris, a Namibian owned company using native Namibians with many years experience leading small groups throughout the country. Our group was thirteen in total which would be split between two vehicles, one driven by tour leader Perez Kamukuenjanje, the tall guy in the photograph and the other by Gerhardus Jansen, the shorter guy. Interestingly, Perez received his distinctly non-Namibian first name from former U.N. Secretary-General Javier Pérez de Cuéllar, whom his father credited with being a major force in pushing for Namibian independence. 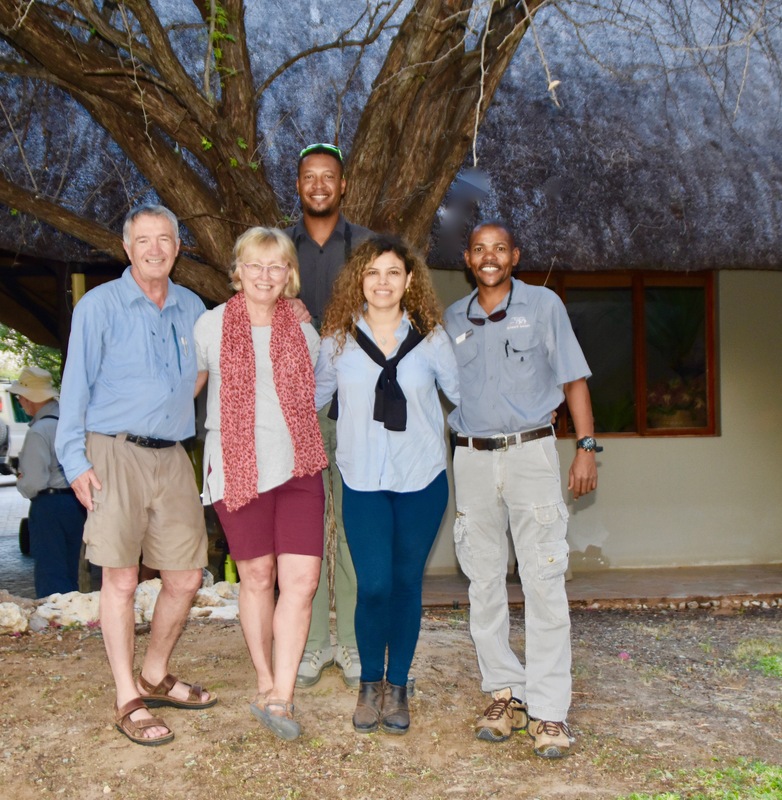 On this trip we were also joined by Gabriela Rodriguez from Adventures Abroad head office who was there to ensure that the service provided by Ultimate Safaris was up to par – it was, in spades. Perez and Gerhardus were not only excellent guides, but great ambassadors for the people of Namibia. 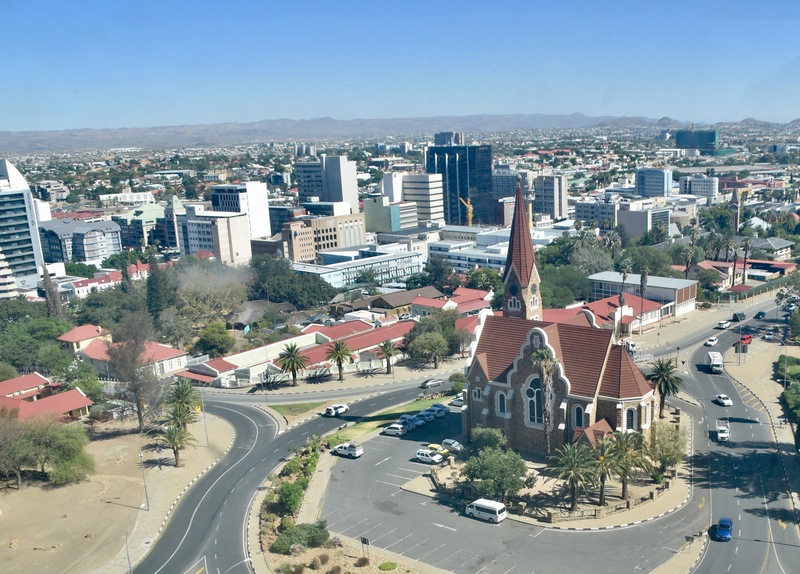 While the tour starts and ends in Windhoek, the very modern and clean capitol of Namibia, there is no actual tour of the city on the itinerary. I strongly recommend arriving a day early, not only to get adjusted to the time change, but also to spend some time in downtown Windhoek. Galton House, the AA hotel in Windhoek provides a shuttle service to the major sites for a reasonable fee. If you have the time be sure to visit the excellent Namibia Independence Museum which I describe in this post. It will give you an insight into the many struggles the Namibians went through to achieve independence in 1990. 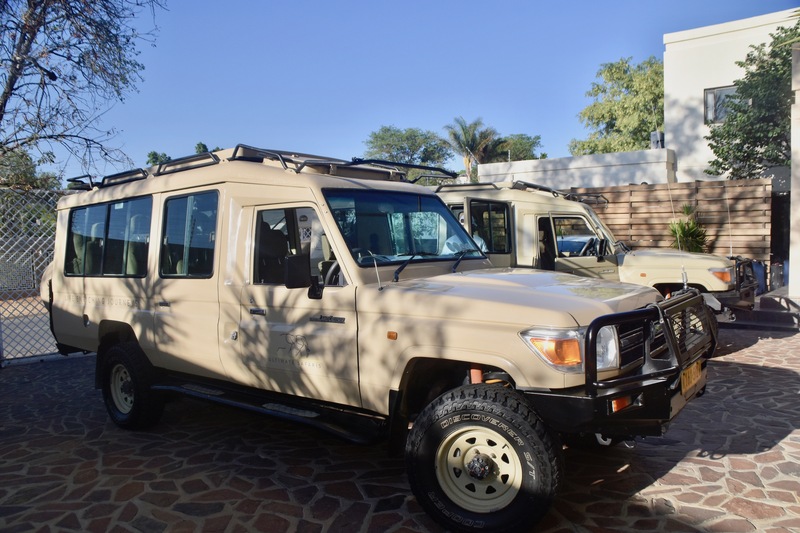 The vehicles used by Ultimate Safaris are Toyota Land Cruisers that have been specially adapted for the rough roads and high heat of Namibia. Perez and Gerhardus arrive at the hotel with vehicles spotlessly clean. They won’t stay that way for long. Perez’ vehicle has a small trailer which easily accommodates all our luggage leaving plenty of room up front. 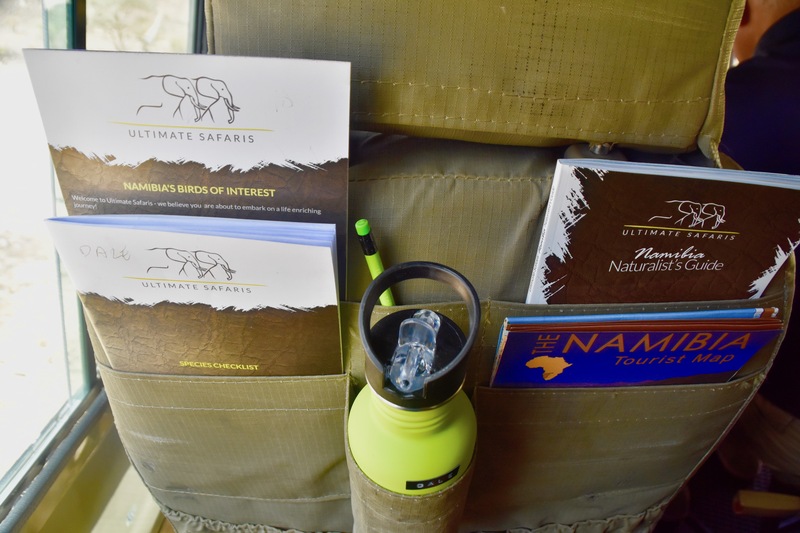 We are each given a safari handbag that contains a water bottle with our name on it, a Naturalist guide to Namibia, a road map, a wildlife check list and a picture guide to the most prominent birds of Namibia. Here they are laid out on the back of the seat for easy access. We are also provided with updated personal itineraries. No excuses for not being prepared for what we are about to see or where we are going. OK, let’s get this show on the road. Below is a Google Map I’ve created that contains the highlights of the trip. Just click on each blue area and it should show you why each area was an important part of the trip. Essentially we traveled in a clockwise direction from Windhoek visiting four major areas where we spent at least two nights starting with the Namib Desert, followed by the Skeleton Coast, Damaraland and finally Etosha National Park. Each destination was a completely distinct ecosystem with different plant and animal species, geology, human history and most important of all – weather patterns. 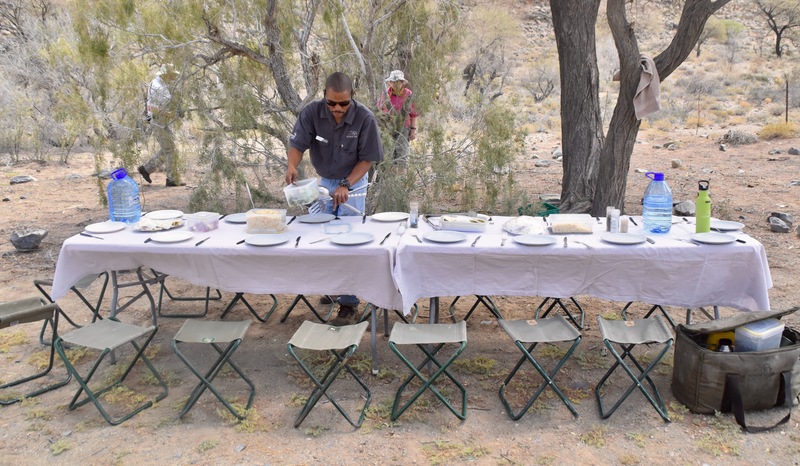 Who knew you could both bake and shake on the same day while exploring Namibia? So let’s get started with the Namib Desert. Our first destination was also the one I think most people associate as being uniquely Namibian. 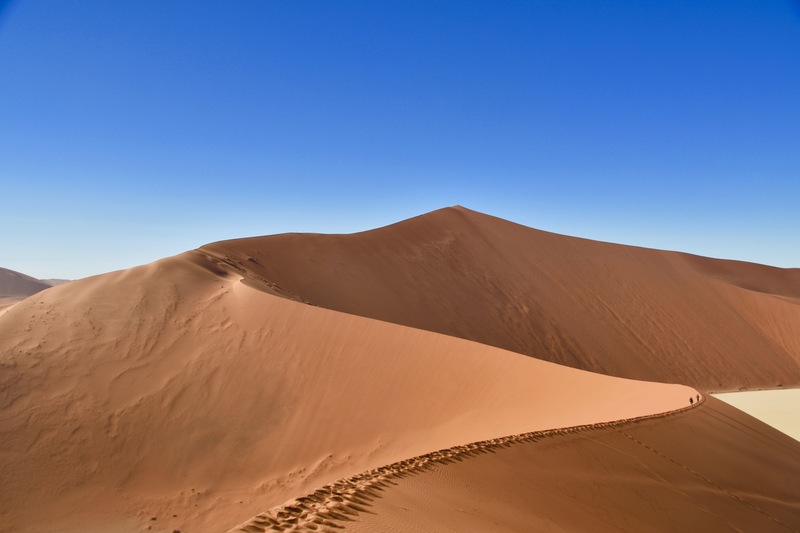 Not only is the Namib Desert the oldest in the world, it also has the world’s largest sand dunes. That is reason enough to add Namibia to your bucket list. The picture above is the trek to the top of Big Daddy dune which is one of the highest in the world – taller than the Empire State building. Getting to the Namib involves driving south on the paved B1 highway to the interesting town of Rehoboth from where you turn due west on the first of what will be hundreds of kilometres of dirt road. Say goodbye to pavement for the next three days and hello to bump, bump, bump. Somewhere along the way we stopped for our first al fresco lunch under the shade of a large camelthorn acacia. That’s Gerhardus setting the table. This was also where we had our one and only flat tire which Perez and Gerhardus fixed in record breaking time. Each vehicle carries two spare tires and the trailer one more so it would take a real string of bad luck to ever run out of spares. The further west we go the dryer and more arid the landscape gets and by the time we get to Sesriem vegetation is almost non-existent. 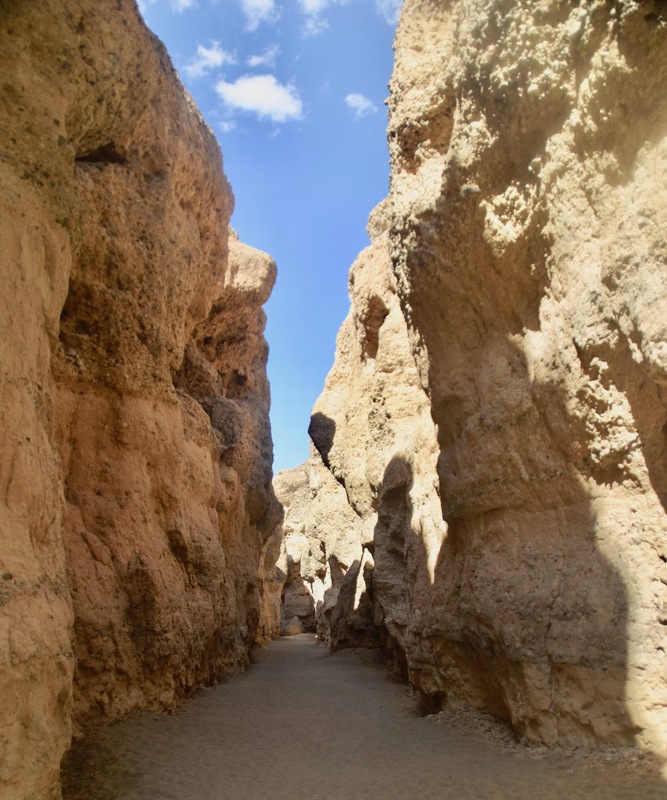 At Sesriem we get out to explore the moderate depths of Sesriem Canyon, following its course to a dead end where a pool of stagnant water apparently attracts oryx and the occasional goat, but not today. Still its a very cool place, both figuratively and literally, the almost perpetual shade lowering the temperature from the rim above considerably. After the canyon visit we head to Kulala Desert Lodge for a two night stay. I will describe each lodge in more detail later in this post. The next morning we set out to explore the Namib Desert by heading to an area known as Sossusvlei where we travel through the dry Tsauchab River valley with the sand dunes on both sides of the road getting higher and higher. At Dune 45 we get a chance for a warm up scramble up a dune to see if we have what it takes to tackle the upcoming challenge of Big Daddy, arguably the highest sand dune in the world and featured in the photograph at the beginning of this section. Arriving at Sossusvlei, Alison and I are content to go about two thirds of the way up to a natural crest and then take giant steps back down what would would be a double black if it was a ski hill. The sand acts as a natural brake and it’s not as scary as it looks from above. Kudos to Susan Stern for being the only one in our group to make it to the top. Gabriela, I won’t mention where you pulled the plug. At the bottom of Big Daddy is the amazing Deadvlei salt pan with its famous tree ruins that are a photographer’s dream. Even if climbing a sand dune is not your thing, just wandering among these trees make the trip to Sossuvlei one you’ll always remember. Back at the lodge I cannot help but notice a few things, two that did surprise me and one that didn’t but still caught me totally unprepared. The first is how much the Namib cools down at night. Expecting sweltering heat 24/7, I found instead what would be pleasant summer evening temperatures in Canada. Secondly, I was bothered by something I could not really put my finger on – something was really different here. Then I got it. This was the quietest place I’ve ever been to. There was no wind, no birds, crickets or tree frogs chirping and definitely no sounds of human existence like jets flying overhead. Just like we now recognize and value dark sky areas for their absence of artificial light, I think the Namib should be recognized as a place of natural quietude. Speaking of dark skies, I did expect to see to see the overhead night sky to be ablaze with starlight and it was, at least until the moon rose like a massive celestial flashlight and drowned out most of the stars. Who would have thought you’d be cursing at the moon for ruining a perfectly fine night of star gazing? It was fun pointing out the Southern Cross and seeing the very familiar Orion constellation, except that south of the equator he’s standing on his head. Anyway, you get my drift – the nights in the Namib are truly special. 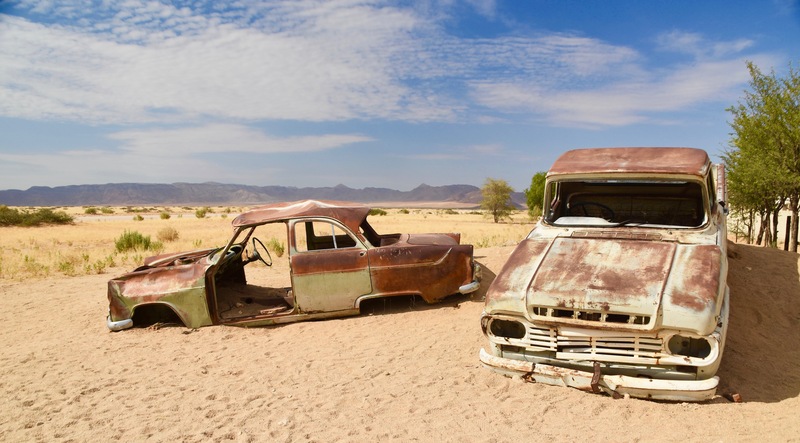 Leaving the Namib, we headed north to the tiny settlement of Solitaire where cars and trucks go to die. Later we stopped to obtain proof that we were crossing the Tropic of Capricorn. Turning west once again we headed for Namibia’s infamous Skeleton Coast where the dunes of the Namib literally come right down to the Atlantic Ocean and the ice cold Benguela Current creates an almost perpetual fog bank that covers the coastline for hundreds of kilometres. 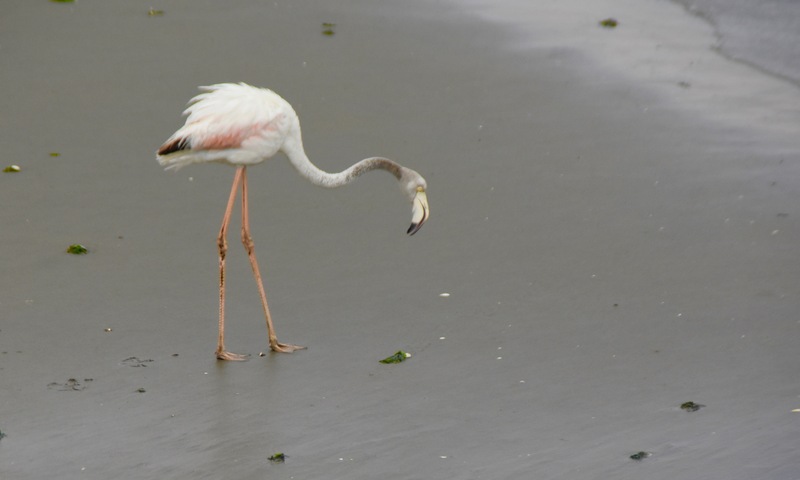 We lost the sun to the fog well before entering Walvis Bay where we had an all too short stop to photograph the flamingoes and pelicans that make this area a magnet for birders. Our destination for the next two nights was the almost surrealistic town of Swakopmund where it appears from the architecture and the names of the businesses that you have somehow been teleported to a North Sea resort. Who could imagine a resort town whose principal attractions were the cold weather and lack of sunlight? Well, if you had to endure the searing heat and aridity of Namibia during its summer months, then cold and foggy don’t seem so bad. 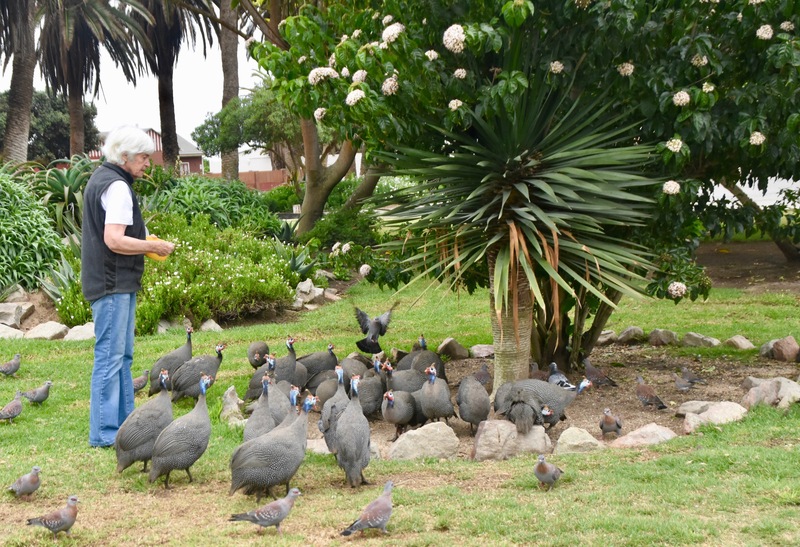 We had a day to relax in Swako, as the locals call it, visiting the excellent aquarium, the museum, walking the jetty, taking pictures of the lighthouse and watching the pied piper of Swako being followed by a host of squabbling Guinea hens. 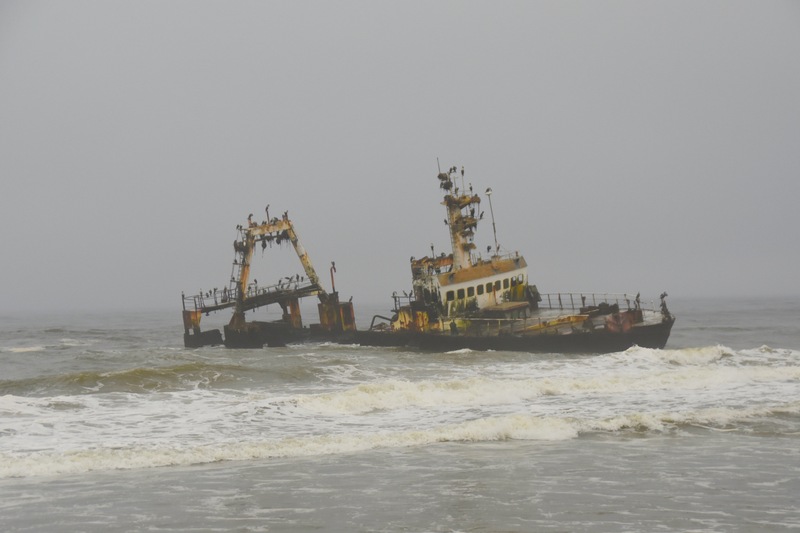 Leaving Swakopmund we drove up the Skeleton Coast to observe a wreck that helps preserve its notoriety as a coastline of danger. Even with the benefit of modern navigation technology wrecks like this still happen. Oh well, it keeps the nesting cormorants happy. We now left the Skeleton Coast behind, driving northeast on wide unpaved roads to the heart of Damaraland, where Gerhardus family resided. On our left the huge presence of Brandberg, the highest mountain in Namibia, was visible for what seemed like the entire day. Veering off onto narrower and rougher roads then we had seen to date, with seemingly no road signage, we arrived at Twyfelfontein, one of Namibia’s two UNESCO World Heritage Sites. How you would find this place on your own, I have no idea. 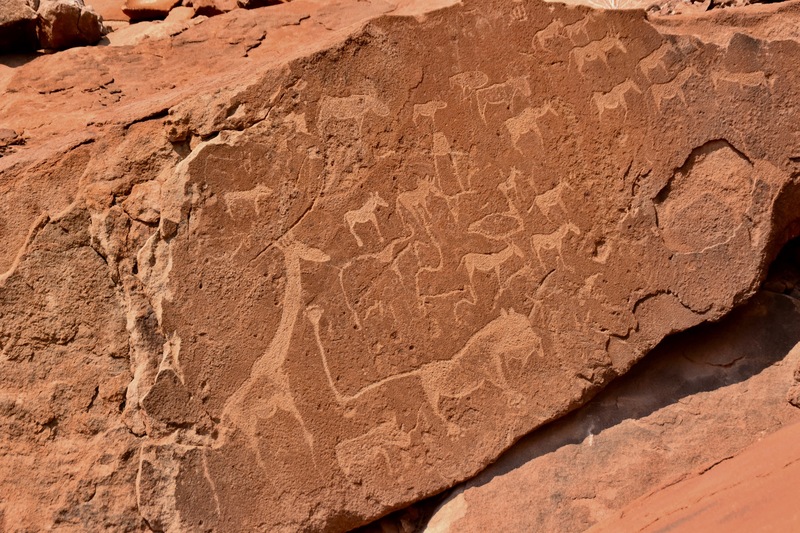 Here we were taken on a guided walk through the engraved rock carvings that date back as much as six thousand years. Unlike most rock art which involves painting or dyeing the figures onto the rocks like the famous cave paintings of Lascaux, the figures at Twyfelfontain were carved into the soft rock using flint or other harder stones. On the bottom of this rock is the lionman, a depiction of a shaman turning into a lion in order to, I don’t know what. Our second day in Damaraland centred around one of the highlights of the trip – tracking desert elephants. Given their size you’d think elephants would be hard to miss, but desert elephants in Namibia are very nomadic and the chances of finding them on any particular day are only about 50/50 according to Perez. It was starting to look like we would not find them after several signs of recent activity ended up as dead ends when almost by chance we found a group foraging along a dried up riverbed including this mother and young one. There was something especially satisfying about searching for and finding the elephants the same way big game hunters would have in the past, knowing that all we were going to do was photograph them and leave them for others to see on another day. Later in the day we came upon a group that were lying down asleep in an afternoon siesta, something I’d never witnessed before. Our next three days were spent on a number of games drives in Etosha National Park which is a huge expanse in northwest Namibia that features the Etosha Salt Pan ,the largest in Africa. Etosha is Namibia’s answer to the Serengeti with a fraction of the tourists. While it does not have the great numbers of animals that some of the East African parks do, it does have a great variety. The game viewing in Etosha takes place principally around the many natural and man made water holes that attract animals at all times of day. You do not need to track the animals across a savannah, they come to you. 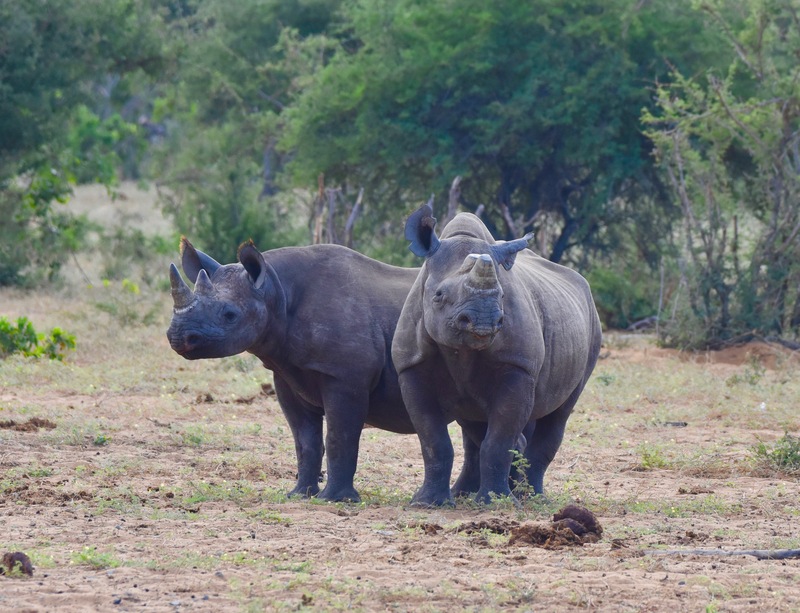 Some of the highlights of Etosha were black rhinos including this mother and daughter pair. We also saw many lions including this pair from not more than twenty feet away. And a herd of elephants who literally stormed into a waterhole trumpeting their arrival and scaring the bejeesus out of any animals already there. I never saw a hyena move so fast. 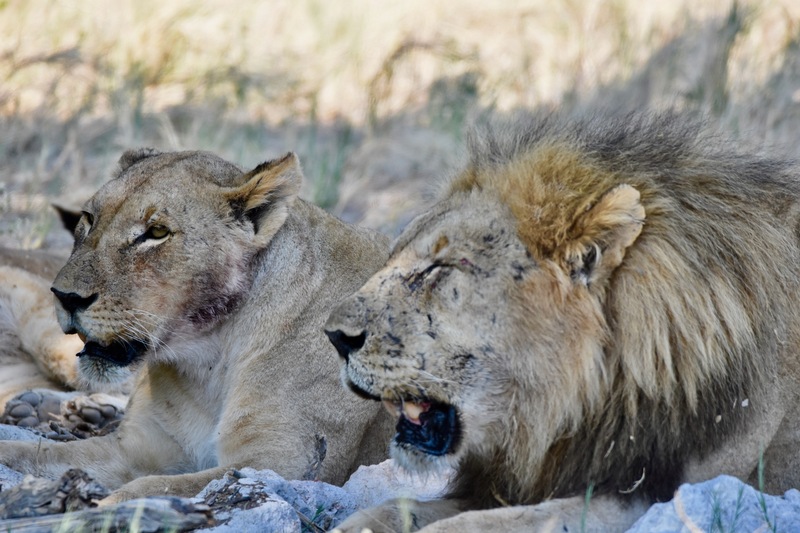 In terms of wildlife viewing Etosha was the climax of the trip, everything preceding it just a warm up. After Etosha we returned to Windhoek and Galton House by way of very good paved roads, not missing at all the jolting we had taken over the previous week on the secondary dirt roads. We enjoyed a very nice final dinner at the excellent Stellenbosch Wine Bar & Bistro where even an unexpected rain and thunderstorm could not disrupt the camaraderie of the group that had developed over the past ten days. All told we stayed at six different hotels or lodges during our stay in Namibia and every one was up to snuff and most were, in my opinion, outstanding. Namibia is not an expensive country relative to some others in Africa and Adventures Abroad was able to get a lot of bang for the buck to use a tired but true cliché. Galton House where we began and ended the trip is a nice little boutique hotel where our group pretty well occupied the whole place. The rooms are a bit small, but quite comfortable and the place has a very relaxed atmosphere. We spent a lot of time in the lounge area getting to know each other at the beginning of the trip and decompressing at the end. Kulala Mountain Lodge at first looks like its in a God forsaken barren landscape, but once you are there it’s really more like an oasis. Each couple got their own very large cabin with decks from which the stargazing was fantastic. The Namib was the hottest place we stayed with the temperature breaking 40º C (104 ºF) one afternoon, which made the swimming pool feel like a welcome ice water bath. In Swakopmund we spent two nights at the very prim, proper and Teutonic Hansa Hotel where the bell boys (yes they still have bell boys) dress in blue livery with those cute round bell boy hats. 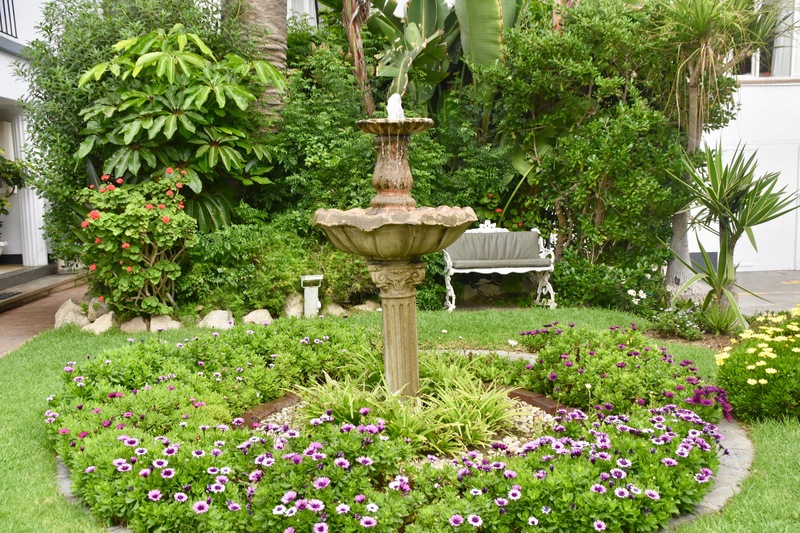 It has a lovely courtyard garden where the birds use the fountain as a swimming pool and is actually a very nice place to stay. A complete contrast to the safari lodges with the most reliable internet of any place we stayed. 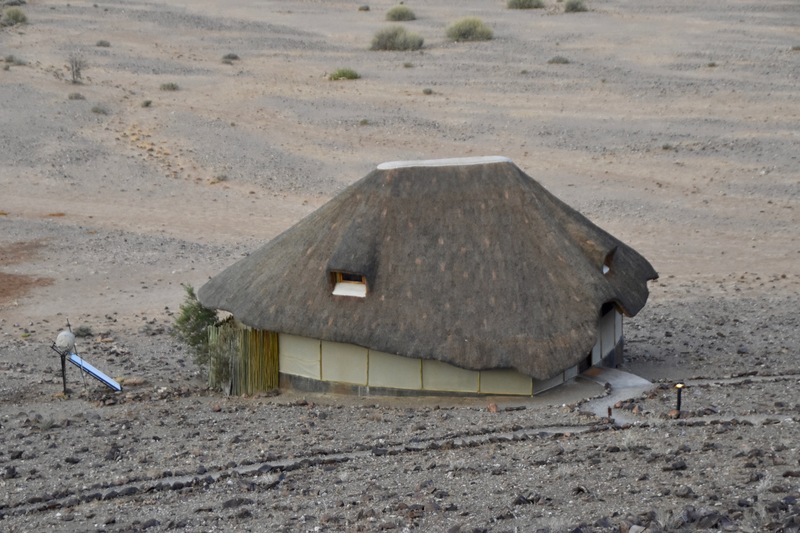 After the urban hiatus in Swakopmund it was back to the desert and the fabulous Doro Nawas Camp in Damaraland which sits atop a high hill looking from a distance like a French Foreign Legion outpost. It is surrounded by very spacious ‘camps’ that are really luxury mini lodges. This was ours. In Etosha we spent the first night at Etosha Safari Lodge which was just fine, but my least favourite on the trip and I know precisely why – it is huge. With 65 cabins it dwarfed any other safari lodge we stayed in. It seemed to take five minutes walking uphill in blasting heat to get from our cabin to the main lodge. If Etosha Safari Lodge was too big for my taste the Mushara Lodge where we spent the next two nights was perfect. With only nine rooms our group had the place to ourselves. 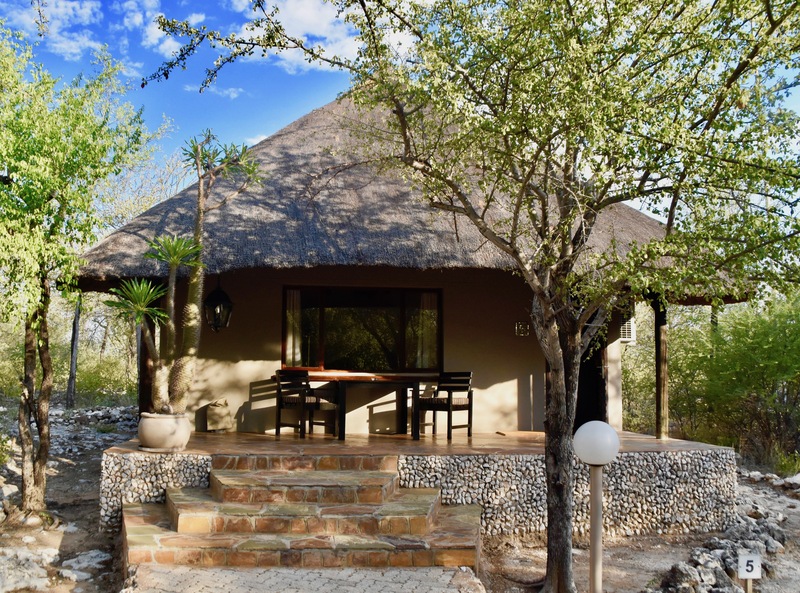 It was also in the greenest location of any of the lodges with plenty of trees and shrubs that in turn attracted many species of birds and other visitors like dik diks, duikers, dassie rats (they’re actually more like squirrels than rats) and a family of wart hogs. Mushara Lodge was my personal favourite in Namibia, but no one could honestly be displeased with any of the places we stayed. One final note on accommodations. Upon arrival at the safari camps it is customary to be greeted with a cold towel and a cold drink. 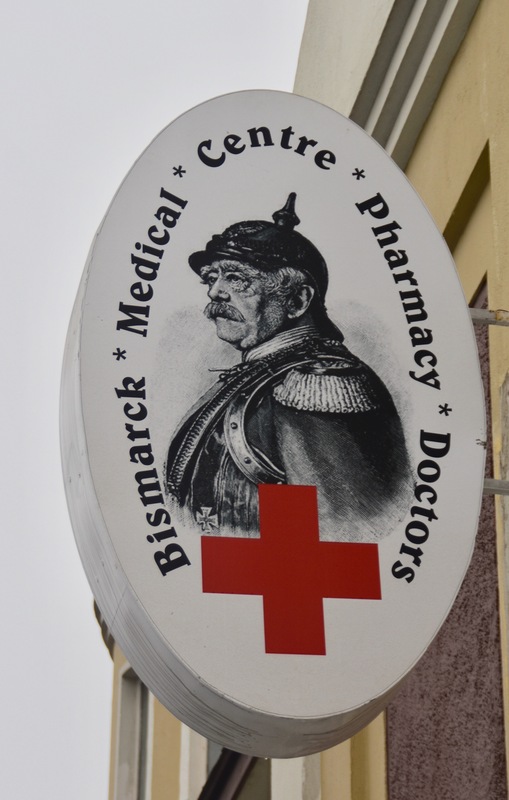 Often the entire staff will be on hand to sing their welcome song – each place has their own version. At night after dinner, you might be entertained by traditional tribal dancing and music native to the area. These are nice touches that remind you that you are not in Kansas anymore. First the good news. Namibia is one of the safest countries in Africa when it comes to the purity of the water and the cleanliness of the food. While through sheer habit we drank bottled water, the tap water almost everywhere we went was quite potable. The reliability of the water in turn translates into the fact that the fresh fruits and vegetables that are taboo in many places are just fine in Namibia. Much to Alison’s approval I ate fresh fruits and vegetables every day. The salads were excellent, particularly at Mushara Lodge where they grew their own. I also found the yoghurt excellent. So vegetarians will have no problem on this trip. For carnivores there is the opportunity to try numerous farm raised game species like kudu, oryx, impala and others. In Swako you can indulge your seafood habit with great fresh fish, prawns and oysters. It’s a welcome change of diet almost half way through the trip. Given the German background of Namibia it’s not surprising that there are lots of good baked goods and pastries available. Finally, the ice cream in Namibia is terrific, as creamy as it gets and given the heat, a welcome daily treat. In terms of what to drink, again the German influence is hard at work. Windhoek lager is made strictly in accordance with the German purity laws of the 16th century and is very refreshing. Savannah cider from South Africa is another good choice. The wines are pretty well all imported from South Africa and they are uniformly very good and very reasonably priced, so you won’t go broke indulging yourself in Namibia. For teetotalers, there’s a really good Namibian sparkling water as well as the usual Coca-Cola products. Pepsi drinkers are s.o.l. And now for the bad news. Well actually there isn’t any and that pretty well sums up the entire Namibian experience. I’ll be following this post up over the next few months with more detailed posts on the various areas and activities we enjoyed while exploring Namibia. I hope you’ll enjoy them. Many thanks again to Dale from The Maritime Explorer for allowing us to share this excellent post!